Conservationists recently breathed a sigh of relief that key threats to the Leuser -- including government schemes for oil palm and mining development that would also promote illegal forest clearing, logging, and poaching -- were being set aside as part of a moratorium on forest destruction. The biggest new threats are proposed energy plants and roads to be constructed in critically important areas for conservation. These proposals are being touted as promoting sustainable development in Aceh, but in reality they will lead to severe environmental degradation. 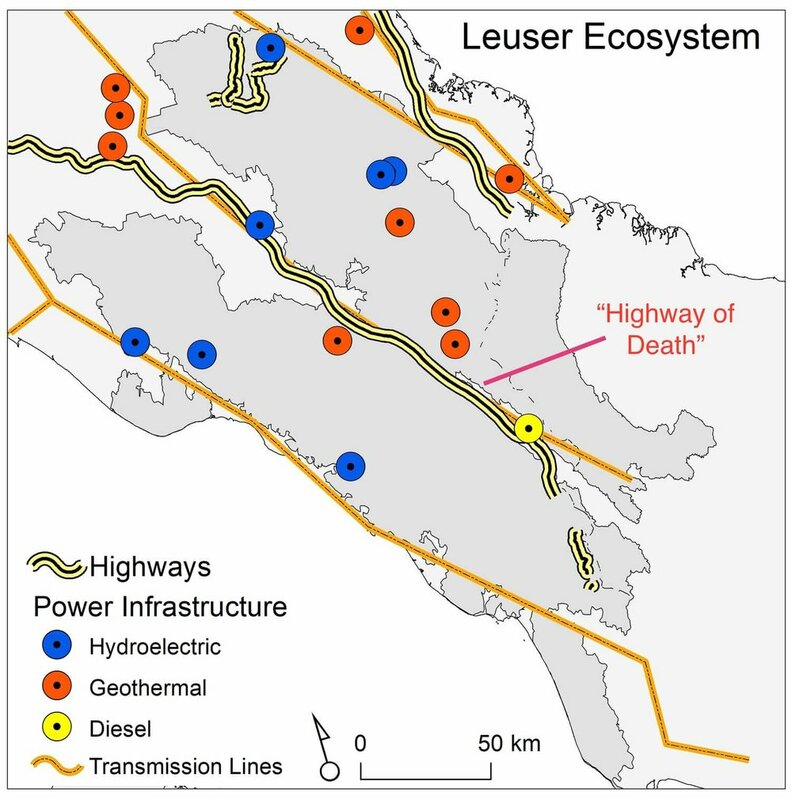 Two particularly alarming developments are a massive new geothermal plant planned by Turkish company PT Hitay Panas Energy in the heart of the Leuser Ecosystem, and a major hydroelectric scheme on the Kluet River proposed by PT Trinusa Energy Indonesia. Both schemes are being fast-tracked by senior levels of the Aceh Government, as evidenced by a recent letter of support from the Governor of Aceh Province. This letter requests Indonesia’s Minister of the Environment and Forestry to rezone part of Gunung Leuser National Park, which comprises a critical element of the Leuser Ecosystem. Re-zoning this area would allow the proposed mega-geothermal project to proceed. But this would set a damning precedent -- promoting large-scale projects in a UNESCO World Heritage Site that is already formally considered "In Danger". Why is the government pushing these destructive plans within a World Heritage Site? Especially when far more sustainable locations -- such as the Seulawah and Takengon regions that are much closer to existing transmission networks and major population centers in Aceh -- are readily available? Alarm bells are ringing. A number of local civil-society organizations have already written to the President of Indonesia, the Minister of Environment and Forestry, the Minister of Energy and Mineral Resources, the World Conservation Union (IUCN), and many others to oppose the proposed projects. But given the money and power of those pressuring for the new projects, there is great worry that they will be pushed through regardless. “I’m furious. We call upon President Jokowi to intervene immediately. When the forests of the Leuser Ecosystem are opened and disturbed we suffer from fires, flooding and landslides. Too many people have already died from this, and now we see more foreign projects behind plans to destroy our homes, our families and our livelihoods. We have had enough and we will fight this. If we lose the Leuser Ecosystem we lose our one chance at long-term economic development. We could even lose our lives, and those of our families and friends. Thankfully, it appears the giant geothermal scheme in the Kappi region is coming under fire. The Indonesian Minister of Environment and Forestry and her colleagues have been ‘shooting down” the plans in the media and declaring their opposition to the Aceh Governor’s request to rezone Leuser. But this is just one small battle in a tide of attempts to open up the Leuser Ecosystem and other critical wildlife habitats in northern Sumatra for development. For instance, beyond the Kluet River hydroelectric project, which would imperil key habitats for orangutans and Sumatran elephants, additional plans for new electricity projects are being proposed for Gayo Lues District and several watersheds in East Aceh. It is essential that northern Sumatra is monitored closely, to prevent these and other ill-advised schemes being approved in the near future. Your voice does make a difference -- a big difference. Please add your name to GeRAM’s petition to the President of Indonesia to protect the Leuser Ecosystem. Do this for the sake of Sumatra’s unique biodiversity and the local people who depend on these areas for their livelihoods. ALERT will do its best to keep you posted on new developments. Conservationists and environmental scientists get used to hearing bad news. So when there's some really good news it's important to hear that as well. While the battle is far from over, there appear to have been important breakthroughs recently in the longstanding battle to protect the imperiled Leuser Ecosystem in Sumatra, Indonesia -- the last place on Earth where Tigers, Orangutans, Rhinoceros, and Elephants still coexist. Over the last three years, ALERT has been one of the leading scientific organizations involved in this battle (for example, see here, here, here, here, here, here, and here, among others). Many have worked to raise the profile of Leuser, even including the leading actor Leonardo DiCaprio, who visited there recently. But few have had more impact than Dr Ian Singleton, Director of the Sumatran Orangutan Conservation Program. 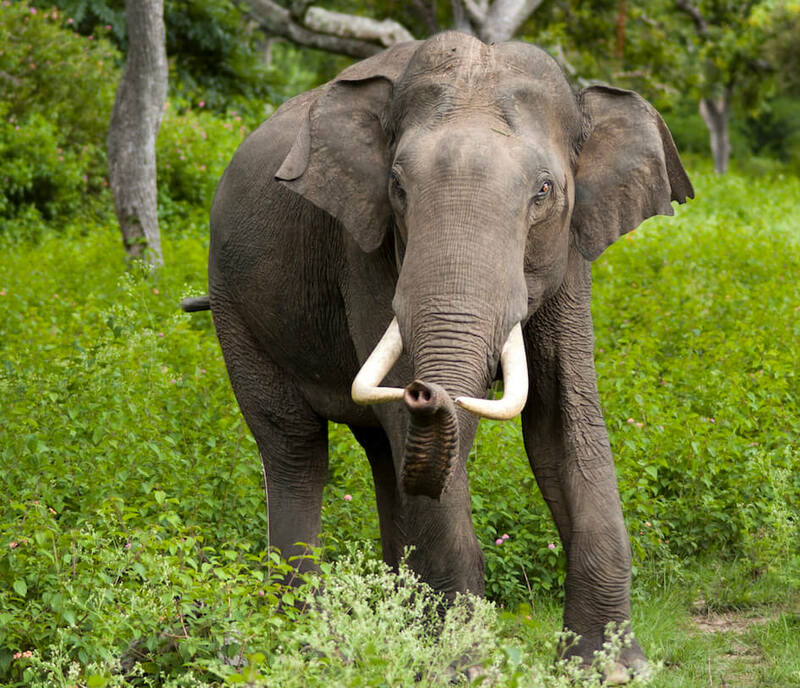 In a recent and highly influential interview, Singleton laid out a remarkably compelling and detailed argument for saving Leuser -- and for the surprisingly limited economic benefits its exploitation would generate for the local Sumatran citizens. You can read his comments and hear his interview here. The most remarkable news of all is that the government of Aceh -- which controls most of the Leuser Ecosystem and has been subjected to scathing criticism for its schemes to destroy much of the region's forests for oil palm, rice and mining expansion while opening it up with a vast road network -- has agreed to a moratorium on new land clearing and mining. This is huge news, and it's clear that both the international community as well as Indonesia's federal government, have played big roles in making this happen. Indonesian President Joko Widodo deserves a great deal of credit for this accomplishment, which he has been pushing for many months -- not just in Aceh but also elsewhere in Indonesia. The economic and environmental think-tank Greenomics Indonesia also deserves a big round of applause for their efforts to facilitate this groundbreaking achievement. Setting the Agreement in Stone? Moratoria can always be cancelled or weakened, but the chances of that happening seem increasingly remote. In her speech last week following the signing of the Paris Agreement at the United Nations headquarters in New York, the Indonesian Minister of the Environment and Forestry, Dr Siti Nurbaya, underscored her nation's commitment to the Leuser moratorium. It seems unlikely the Minister would make this statement in such a high-profile event if there were doubts the moratorium were going to collapse. And the news gets even better. The Deputy Governor of Aceh, Muzakir Manaf, declared this week that he will provide full support for ground-level measures needed to enforce the moratorium. That's critical for two reasons. First, it demonstrates that the Aceh Government itself is getting strongly behind the moratorium. Second, a moratorium is just a piece of paper unless there's real on-the-ground enforcement to ensure that illegal land-clearing, poaching, mining, and other activities don't continue unabated. A final bit of good news is that the Indonesian Minister of the Environment and Forestry has confirmed her intent to completely halt the granting of new permits for oil palm plantations. To be clear, this doesn't mean oil palm plantations won't keep expanding in Indonesia, as there are thousands of existing permits encompassing many millions of hectares of native forest still active. Indeed, Indonesia has previously announced plans to clear another 14 million hectares of native forest by 2020, mostly for oil palm and wood-pulp production. But at least it means that the avalanche of new oil palm permits is coming to a halt, with great credit due to President Widodo and Minister Nurbaya. The fight to conserve Indonesia's mega-diverse forests is far from over. The nation's plans for massive road, dam, and mining expansion -- many in forested areas where such projects can open a Pandora's box of environmental problems -- is enough to frighten even the soberest of observers. But for today, at least, we need to celebrate a very significant victory for nature conservation. Indonesia needs to be applauded and all those who've fought for the Leuser Ecosystem need to be applauded. And while we're congratulating ourselves and others we shouldn't forget to keep a close eye on Leuser to ensure the promised moratorium really does take effect -- where one of the most important wild places in the world still survives. ALERT is joining with other environmental groups to help save the Leuser Ecosystem, one of Earth's most important rainforest regions. This collective effort is called "Racing Extinction". We’re facing the sixth mass extinction. By the end of the century, we could lose half of all species on Earth because of human activity -- and the Leuser Ecosystem is on the front-lines of extinction. Indonesia’s Leuser Ecosystem is like nowhere else on Earth. Stretching over 2.6 million hectares (6.5 million acres), it is the last place on the planet where Orangutans, Tigers, Elephants, and Rhinos still roam together in the wild. For the past two years, protecting the imperiled Leuser Ecosystem has been a key focus of ALERT (see here, here, and here). Help us to advance this effort -- just follow this link. Take action to protect this beautiful and critical area -- one of the last truly wild places on Earth. Malaysia is one of Earth’s 17 megadiverse countries. It straddles Peninsular Malaysia and a chunk of Borneo. With over 220 species of mammals, 620 birds, 250 reptiles and 150 frogs, few countries on Earth boast similar biodiversity to Malaysia. It is also home to bizarre species found nowhere else on earth, often in unique ecosystems such as peat swamps and limestone karsts. For instance, an you guess what this animal is? It’s actually a land snail. In 2008, I discovered that this creature, Opisthostoma vermiculum, is the only one in the world with four axes of coiling. It's known only from a single limestone karst in Peninsular Malaysia. Unfortunately, Malaysia is fast losing its natural forests to oil palm and rubber plantations and infrastructure development, with wildlife hunting an additional peril. A recent study showed that Malaysia had the highest rate of deforestation in the world between 2010 and 2012. As a result, even a network of key wildlife corridors identified by the government may end up being paper corridors. Many endemic plant and animal species are threatened with extinction. 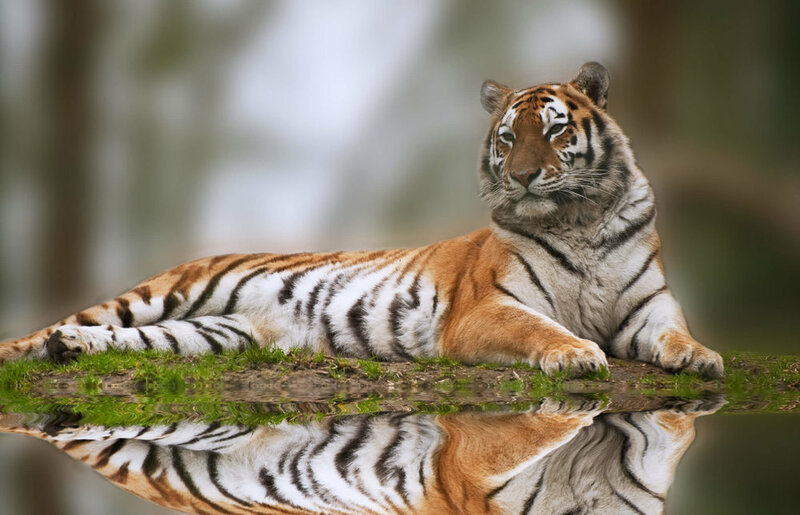 Even Malaysia’s trio of large charismatic mammal species, the Malayan tiger, the Asian elephant and the Sumatran rhinoceros, now face a very uncertain future. To advocate for endangered wildlife, my wife Sheema Abdul Aziz and I co-founded a non-profit research group known as Rimba, which means ‘jungle’ in Malay. Since 2010, Rimba’s biologists have been conducting research on threatened species and ecosystems in Peninsular Malaysia. Our team of young scientists has managed to secure a state-wide ban on hunting flying foxes facing local extirpation, as well as briefly halting development in a crucial wildlife corridor. Rimba hopes its research can help decision-makers in Malaysia to reduce growing threats to imperiled ecosystems and species. Here's our tagline: "we all NEED a jungle out there!" It's the last place on Earth where orangutans, tigers, elephants and rhinos still coexist. It's the last major tract of lowland rainforest on Sumatra--the island paradise devastated over the last decade by corporate oil palm and wood-pulp plantations and slash-and-burn farming. It's the Leuser Ecosystem, and you can help save it. Just take 30 seconds to add your name to this growing petition, appealing to the Aceh government in Sumatra. And ask your friends to support this initiative too--by signing up for ALERT's automatic updates and liking ALERT on Facebook. 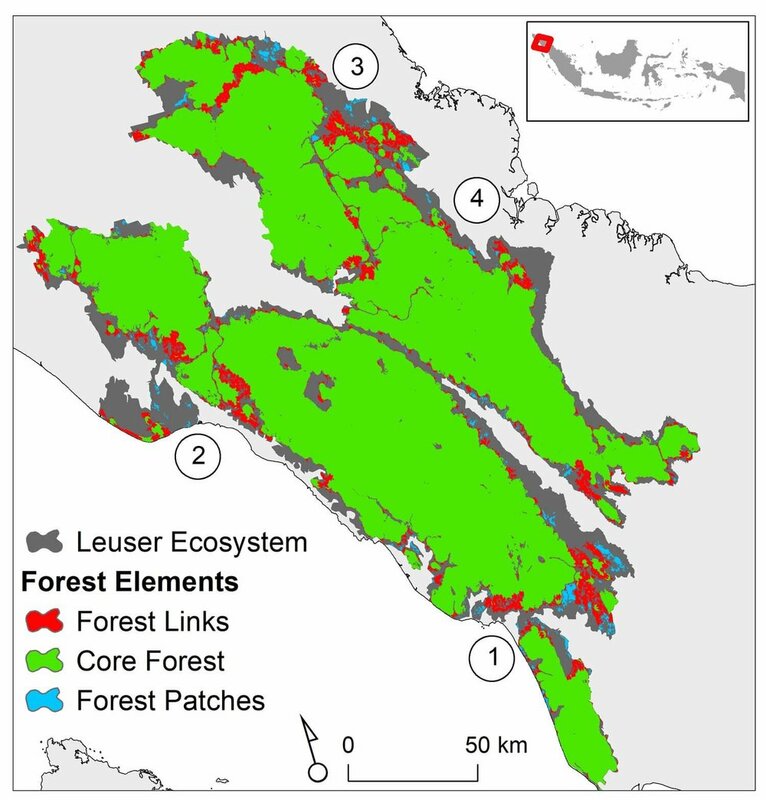 For more information about the imperiled Leuser region, see our earlier blogs and press release.